Start your engines! On your mark! Get set! Go! The latest race in the PUSCAR (Psychotic Union of Severely Crazed Racers) Cup is on! Team Monsters, Rockabilly, Underworld, Aliens, Food Fight and Battle Wizards rip it up on the track to see who is the best of the best. Watch out for hazards, curves and dirty play as each team tries to take you out and capture the checkered flag! In Hot Rod Creeps Customizable Racing Game the ultimate goal is to be the first across the finish line. Players can race 1 lap or a whole circuit and climb the leader board to see who comes out on top. Each player can pick from 6 different teams that each have certain strength you try to exploit against the other opponents. Team Aliens – Collect upgrgades as quickly as possible. Team Battle Wizards – Have one card in hand to access the nitro deck. Team Food Fight – Play cards in a sequence. Team Monsters – Play cards quickly out of their Tank (draw pile) and maintain between empty and half full. Team Rockabilly – Play or flip the top card of their Tank whenever possible as they have more flip cards than any other team. Team Underworld – Track cards in their Tank and hand to avoid getting burned. During the set-up phase a player can build any design of track they can think up. Start with the starting grid and complete it with the finish line. Each player then places their car on the starting grid by drawing them from a cup randomly. There is a rule for whomever has the closest birthday to go first if you chose to do that. A number will be on the starting grid under the players Hot Rod, this is the number of cards that each player draws of their Tank to star your hand. They closer to the front, the fewer amounts of cards are drawn of the Tank. The cards themselves are very simple to read and understand. In the upper left corner is the move value in other words how many spaces a Hot Rod may move when played. Down the left side is the card name and on the bottom is the game text. If it says “Flip Only,” than this card text is only in effect when flipped of the top of the Tank or a deck. As you would assume the pole position goes first and then turn order is clockwise for the rest of the game. Each player may then choose one of the 4 actions for that one action that turn. Play a Move card from your hand. This option allows a player to move their Hot Rod forward the number of spaces of the Move value. This always for planning a bit easier so the player can land in Pit Stops, avoid hazards and take the corners more safely avoiding damage. Any card played this way with “Flip Only” in the text is ignored. Flip the top card from the players Tank. This option is of course random and the player must announce it before revealing it to other players. This is where “flipping” comes in so a “Flip Only” text card will be activated here. The Move value of the card still applies here as well. Flip the top card from the Nitro deck. The Nitro deck is a shared deck between all players and most of the Move values on this deck are between 6 to 9 making it a risky option. These cards can have some nasty effects so play with caution. This may cause you to burn cards off your tank, hit a wall turning a corner taking additional damage. To take this option, the player must have at least one card in their hand. Draw 4 cards from the players Tank. This won’t allow the players Hot Rod to move and it is a more strategic action. If the players tank is almost empty and doesn’t have 4 cards left, then they just draw what is left with no reshuffle. The order of events is resolved by playing the card text first, then the Move value. This is because the game text may alter the actual movement of the Hot Rod. After the Hot Rod has moved then any Upgrade cards a player may have such as weapons or engines upgrades are resolved. These effects could further still affect the Hot Rods movement. Lastly any effects from the track such as hazards, corner damage or Pit Stops are resolved. Pit Stops are spaces that a player must land in directly on the end of their FULL movement turn. The Move value of a card may not be shortened to effect where a player may land. When a player effectively Pit Stops, they then have the option of either Gassing Up or drawing an Upgrade card. A player may not attempt an additional Pit Stop by not moving a second time and drawing 4 cards. If a player chooses this option, then that player on draws 4 cards and their turn is over. Gas Up allows a player to shuffle their discard pile into the remainder of their tank. The players Tank does not have to be empty to do this however, it may be more efficient to draw an Upgrade card if the players is not in danger of running out of gas. Draw and Upgrade card allows a player to draw from 1 of 4 different types of Upgrade cards: Weapons, Engines, Wheels and Pit Crews. This card is put in the appropriate slot on the players Hot Rod Sheet. You can only have one of each upgrade at a time in the appropriate slot. If a player draws Weapons upgrade but already has that slot filled with another Weapons Upgrade then the player chose to replace the current Upgrade or discard it. These Upgrades improve a player Hot Rod and often allow that player to hurt another player. Weapons Upgrades will typically trigger when a Move value of 4 or 5 is played. This affect triggers whether the Move value was played from a hand or off the top of the Tank. This is obviously to harm a fellow opponent. Engine Upgrades again usually trigger when a Move value of 4 or 5 is played either from a players hard or their Tank. Wheels Upgrades come into player when one player Drafts one or more other players. The number of Hot Rods Drafted does not increase the Upgrades effect, but it may affect multiple opponents at once. Pit Crew Upgrades trigger when a player Pit Stops. A player who runs out of gas is forced to Pit Stop and this cards text is triggered. There is a only one Hot Rod per space allowed so if an opponents turn would end in an already occupied space then, that opponent then “Drafts” the Hot Rod already occupying that space. Drafting allows that player to end in the space directly ahead of the occupied space and is trigged by any card or affecting moving a Hot Rod. You can also draft backward as well if a card text forces a Hot Rod backwards. This puts the moving Hot Rod in the space directly behind the occupied space. If a card moves past a Hot Rod, Passing may be in effect. Passing triggers some certain card text and Drafting is considered Passing in this instance as well. Running out of gas occurs when a players Tank (draw deck) is empty and as long as the player has cards left in their hand they are safe. If a player ever has no cards in their hand or tank, they then must move their Hot Rod backwards to the nearest Pit Stop. This is not a movement action, so no Passing, Drafting or other effect takes place. After reshuffling a Tank, then the player draws 2 cards to their hand. A player can take damage called Burn. This effect removes cards from the top of a Tank. Burn can come from cards, hazards, Upgrades etc. When Burn takes effect, the player takes that many cards from the top of their Tank and places them in their discard pile. Damage is an effect that removes cards from a players hand and can happen from card text, corners, hazards and so on. Damage forces a player to discard cards from their hand but if they do not satisfy the damage amount, then that player must Burn the additional cards from their Tank to satisfy the Damage amount. When a players Hot Rod comes screaming around Corners, there could be trouble! A bold red line that has a difficulty maker assigned to it distinguishes a Corner. If a players Hot Rod is going faster than the assigned number than that Hot Rod will take damage. There a few Hazard and Bonus spaces to be aware of as well. These can be added to the track to bring additional mayhem to the gaming experience. You have Banana Peel, Fan Frenzy, Oil, Potholes, Varmint Crossing and Rain Slick hazards while only to bonuses, those being The Spotlight and Sponsor’s Row bonuses. The components are a good quality. This stock for the track, fire hoop, crowd stands etc. However the ramps for the fire hoop could have been much better done as my copy it’s worthless. The cards are of nice quality and the player sheets are ok. The art work is amazing especially if you enjoy Rat Fink style art. Some of the track parts don’t quite fit together perfect but that is to be expected and doesn’t detract from the game experience. My copy came with a Monsters Team sheet missing while I got 2 Underworld Team Sheets. There was a slight bit of damage on a couple of track pieces and to the manual, but I did receive a review copy not a retail copy. Hot Rod Creeps is a very little but very fun stick it to your opponent game. Playing once is a bit of a let down as the game goes quick and the set up and take down time is more than most games so I recommend running a circuit to really get the feel and effect. Running a leader board definitely adds to the game experience. This game has a ton of replay ability to it as the track never has to be the same and the randomness of peoples decisions, Upgrade cards and effects. This is a great game for kids or people who aren’t into heavy strategy. It’s got a comical feel to it and provides for great social gaming and jokes. There is definitely some strategy to this so please don’t think I am saying their isn’t, but it’s light and fun as opposed to anything causing analysis paralysis. If any player suffers from that in this game, don’t play with them again lol. I am giving this game 7 out of 10 stars for fun, replay ability and social gaming. Space…The Final Frontier. These are the voyages of the Starship Enterprisess Their one game mission: to explore strange new worlds. Seek out new resource cards, block resource production from other opponents and boldly win by gaining 10 or more victory points before anyone else. In Star Trek Catan the players scour the universe looking for resources on new planets to build Outposts, Starbases, creating the “Longest Supply Route” and having the “Largest Starfleet.” Players can trade, block, and meet up with the dangerous Klingons while facing having to build in locations that may be plentiful in resource production or very minimal. Each player is trying to build Outposts (worth one Victory Point each) that eventually upgrade in to Starbases (worth 2 Victory Points each) in orbit of the Federation Territories (planets.) Each planet has a random number 1-12 on it, this allows a player to gather the type of resource that planet produces if that number is rolled by a player. Each player starts with 2 Outposts and 2 Starships and 1 Support card chosen at random. Because of this, each player automatically starts the game with 2 Victory Points. Players pick where to put their first Outpost by starting with the oldest player first. The first player then places one of their Outposts and an adjoining Starship on any Federation territory junction and this continues clockwise till the last player places 2 Outposts and then it moves counter clockwise until the players have placed both of their Outposts and Starships on the game board. The player must roll the dice for resource production. This result gives all players with an Outpost or Starbase on that number a resource from that planet. A player may get more than one resource depending on how many Outposts or Starbases are located there. Each Outpost produces 1 resources and each Starbase produces 2 resources. The player whose turn it is may trade resources with any other player during their turn. That player may listen to offers and any counteroffers. A player may not trade if it is not their turn unless it is only with the current players turn. The current player may also trade with the Border (bank) by trading any 4 of one type of resource for 1 of any other type of resource. If the player has an Outpost/Starbase that borders trading post, then they may be able to trade at a 3:1 or 2:1 rate. The player may build as many Outposts, Starships or Starbases as their resource cards allow. The player may also play 1 of their Support and/or 1 Development card any time during their turn. Building allows a player to increase their resource production as well as giving them more Victory Points. To be able to build, a player may not build closer than 2 space intersections from another player. Starship – I Dilithium and 1 Tritanium resource card. These are built along the space intersection connecting their Outposts/Starbases together. They may not be built of any other player’s routes or Outposts/Starbases. Once a player has built a route of 5 or more Starships that do not branch off, they may receive the “Longest Supply Route Card” worth 2 Victory Points. This card may change hands many times during the game. If there is a tie for the longest route, no one holds the card. Outposts – 1 Food, 1Dilithium, 1 Oxygen and 1 Tritanium are required to build 1 Outpost. The player must build the Outpost adjacent to one of their Starships and the player must make sure they are 2 space intersections away from any other (including their own) Outpost or Starbase before building. When building a new Outpost, that player now has the possibility to increase their resource production if that planet number is rolled. Starbases – 3 Water and 2 Oxygen are required to build the Starbase upgrade to the current Outpost. This attachment goes on top of the current Outpost and doubles the resource production of the current Starbase. The Starbase must be built on a current Outpost and cannot bypass the Outpost building stage. Resource Cards – 1 Water, 1 Food and 1 oxygen are required to buy 1 Resource Card. This card is drawn from the top of the stack and held in secret until the player chooses to reveal it. Most Resource Cards may not be played until after the turn in which it was purchased. Victory Point Cards – The players must keep their Victory Point Cards hidden until they have 10 Victory Points or more and then reveal them. These cards may be played on the turn they were purchased to win the game. Starfleet Intervenes cards – If a player plays this card, they must move the Klingon Battle Cruiser (more on how this works below.) Once this card is played, it will remain face up in front of the player that played it adding to their Starfleet size. Once a player has 3 Starfleet Intervenes cards face up in front of them, they may claim the “Largest Starfleet” card worth 2 Victory Points. This of may change hands many times during the game. In case of a tie, no one holds the “Largest Starfleet” Card. Progress Cards – These cards have text on them that the player may then activate to receive its bonuses. Once played, these cards go out of the game. Support Cards are Star Trek: TOS characters with special text on them to help the players who holds it. They have both an A and B side to them. Once a player uses side A, they have the option to either flip it over to side B and use it again later or they may return it to the Support Card display and choose another that is available. If the player chooses to keep the Support Card after using side A, once they use side B, they must return it to the Support Card display and choose another card. A Support Card may not be used the turn that it was acquired. The Klingon Battle Cruiser is activated once a “7” is rolled by a player or if a “Starfleet Intervenes” Card is played. The following is what happens when a “7” is rolled or a “Starfleet Intervenes” card is played. If a “7” is rolled on a players turn, no player will receive any resources that turn from production. Any player that holds more than 7 cards in their hand at that time the “7” was rolled must put half of their hand back into the resource supply rounded down. The player that rolled the “7” must move the Klingon Battle Cruiser to a planet sector or to the asteroid sector although moving it to the asteroid sector usually doesn’t make much sense. The player then “steals” 1 resource from 1 opponent who has a Outpost/Starbase currently in orbit of the planet on which you placed the Klingon Battle Cruiser. This planet no longer produces any resources as long as the Klingon Battle Cruiser is on it. The game ends as soon as a player reaches 10 Victory points through any combination of Outposts, Starbases, Victory Point Cards and Special Cards such as the “Largest Starfleet” or the “Longest Supply Route”. The components of Star Trek Catan are exceptional. The photos are taken from the Star Trek: TOS from the “Wrath of Kahn” or after. The tiles and edge pieces are very thick and will last forever; the Starships, Outposts and Starbase pieces are detailed and very cool. The cards stock is thick enough to not bend to easily but they are glossy which does make them slippery and they are all smaller than the original Catan. It would have been better if they were normal size so they could have been sleeved if needed and textured just to be easier to handle. That is my only complaint though. The box art is very cool, and the box insert is nicely done as well. Star Trek Catan is a remake of the famous “Settlers of Catan” and so much of it is very much the same with the exception of the theme and the Support Cards. I know a lot of people were like “another Catan?” or “Isn’t this just over kill and license gouging” but I say nay! The theme works very well with this game. Star Trek has a huge audience and let’s be honest there have been a plethora of bad Star Trek games through out the years. Attaching Star Trek with the Catan game library was a smart move and it fits very well along side all the others. The addition of the Support Cards adds a whole other dimension to the game no pun intended. It allows people to get back in the game easier as well if they are struggling due to placement. This version of Catan has become my go to version to play and it has completely refreshed it for me. This was a win/win situation for the both Catan and Star Trek. We already know that this game has a ton of re-playability as the board is never the same and there are so many different variables to chose from. Adding the theme just makes it MORE fun that it already was. Catan being the game the re-energized the board game industry has done a good thing here and made a great game slightly better than it already was. This game belongs on every board gamer’s shelf and most certainly every Star Trek fans. Due to the theme, added Support Cards built on a game that was already great and revitalizing a game many of us had played out, I am giving this 9 out of 10 stars. Snake Oil is a party game/card game from Out of the Box Games that has a history of putting out quality games that are great for families. In Snake Oil, you have one player who is the customer per turn. The customer draws a card that says what kind of customer that player is such as Astronaut or Senior Citizen while the other plays have to use two of the six word cards in their hand to come up with a “product” to sell the customer. Whichever player the customer thinks did the best “pitch” gets the customer card. The game is played in one round until everyone has had the chance to be the customer. Whomever has the most customer cards at the end of the round is the winner. When I broke this game out, I thought it would not be a hit with my household. Boy was I wrong. My 11 year old daughter LOVED it! We played it the whole afternoon and again for a couple hours the next day. So far everyone I have introduced it to has liked it and would play it again. Snake Oil is based on social interaction so obviously it keeps everyone involved even when not making the pitch. You are so busy listening and laughing at what people are coming up with you are involved the whole time. The pitch is only 30 seconds long at most according to the rules so the game goes very quick. Snake Oil hits with all ages as well which is great for family game nights or holidays. The benefits of this game are also quite amazing. It helps people who are not good at public speaking, need to work on crafting a sales pitch on the fly (hint: salesmen), learning to identify hot words with people to get to know them better and so on. It’s a great tool for many reasons beyond just the game aspect of it. Most people would probably compare this with Apples to Apples and it is obvious why. It’s a different game and in my opinion based on the having to come up with a pitch and “sell” it to the customer a better one. It requires more thought yet takes no more time to learn or play. Snake Oil takes the best of “party games” in it’s simplest form and provides a hilarious experience in no time at all. One of the great things I like about this game is rules all fit on one side of the box, in an attempt by Out of the Box Games to be more green! This is a great idea number one and number two, it means it is a very easy game to learn. That is sometimes very important when trying to teach a new game or having people over and you want something simple to break the ice. The components for Snake Oil are very simple. A great tray insert for the box that works very well and cards which are decent quality with art that is cute and perfect for kids. A few of the cards did stick together a bit and caused a minor amount of damage upon opening but only a few. The cards aren’t thick and will wear out with a lot of game play so if you are a gamer or family that does lot’s of party type games, card sleeves may be in order here. In conclusion, Snake Oil is more than worth the $19.99 investment. It will hit the table a lot in my house as my daughter loves it and getting time with her is the most important think I can think of. If you are looking for a GREAT party game that works well with all ages and levels of gamers, Snake Oil is the one for you. We are giving Snake Oil 8.5 out of 10 stars as it is just about perfect for what it is going for. Well done Out of the Box Games and Jeff Ochs! That is one of the highest ratings if not the highest ratings we have given any type of game. Scooby-Doo and the Mystery Inc. gang our involved up to their necks in their next mystery. There is some strange things going on at the Mystery Mine and Scooby-Doo and crew are on the case sniffing out clues and looking for leads. Beware as there are 8 traps along the way and danger is a plenty! Which of the suspects did it? Which of the gang is going to be the first to figure out the mystery? Will it be you? My daughter who is 11 years old and I LOVE Scooby-Doo! We have all the movies, TV Series, some of the toys and most of the games. It’s what we do with our time together a lot of the time. She really wanted this game for Christmas so of course she got it. We have the other game like this called the 3-D Haunted House Game which we love so we were excited to play the Mystery Mine Game. The players have the choice to be any of the Mystery Inc. gang. As with the other game, movement is decided by a spinner. As you move through the mine, you encounter clues that help to reveal the culprit. You also encounter 8 different traps that will slow down your investigation so be wary! The first player to the top of the mine will be able to guess who the culprit is and will have hopefully seen the three clues needed to make the accusation. The first player to get it right wins. Granted these games are very simple and easy to play and understand which is why it saddens me to say that my experience with this game isn’t really a good one. First off all, the game fluctuated in price greatly during the holiday season. It had gone up as much as $10 dollars at Target. Secondly, the cart that rolls down the mine shaft doesn’t really work. There is a trap immediately after the release of the cart and it stop the cart every time from progressing any further. I would have to physically hold the first trap up to allow the cart to have a chance at moving down the mine shaft. The second trap veers the cart down one track or another and it often stops the cart entirely. The cart only makes it’s way down the mine about 25% of the time which in turn negates the need for the other traps. While I and my daughter finished a few games of this, it wasn’t worth the $29.99 MSRP when the game doesn’t actually provide the experience it is designed to. For a simple game, with a fun theme this one falls flat. You’d be better of just getting the Scooby-Doo Mystery 3-D Haunted House Game and leaving it at that. Putting out a game based on just a license to generate sells isn’t often a good idea and that is what happened here. It obviously wasn’t play tested enough to work out the kinks and sell a workable game. 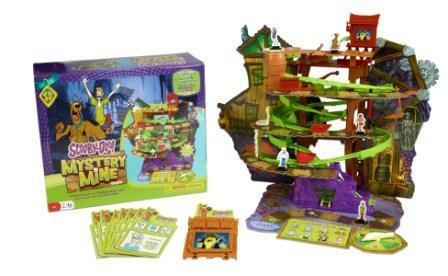 We are giving the Scooby-Doo Mystery Mine Game 3 out of 10 stars. Peace, tranquility and beautiful patterns. This is what we think of when we think of Japanese rock gardens. Now players can create their own beautiful, tranquil gardens while trying to win a quick tile laying game while blocking their opponents. Sounds peaceful right? Zen Garden from Mayfair Games comes with two different games inside the box, Zen Garden and Rock Garden which means two games in one! The idea is to build their signature pattern twice with two different types of terrain tiles. In a nutshell, each player draws tiles from a bag representing different landscapes (water, trees, rock, grass and lanterns) and tries to build a garden matching their pattern tile drawn at the start of the game. Each player starts with three tiles and has the following options. Places one tile per turn, can replace a lantern tile that matches the terrain of at least one tile adjacent to it, draw a new tile or when ready, may reveal their signature-pattern. After a player has built both garden groups of different terrain types in their signature-pattern, they then reveal their signature-pattern and score 5 points. Those who have not revealed yet score 4 points automatically and lose one point per round they have not revealed from this point on. Bonus points are available as well at end game. Rock Garden is a more challenging game in which players try to play 12 cubes on tiles matching their signature-pattern before the other players place all theirs. Both games come with optional rules to create more challenge to the games. The component tiles are high quality and contain beautiful terrain art. Zen Garden is a simple game that has very surprising depth to it. Even within a 15 – 30 minute time frame, strategic thinking is first and foremost when laying out tiles which lends to a particularly deep game in a very short time. There is a great amount of fun tension when trying to get your gardens built before the other players and you really have no idea what their patterns are to be able to gauge how soon they will reveal. This is a great warm up game for gaming groups waiting for other members to show up or for family looking for great games for family game night. Sometimes the best games are simple and cost little and Zen Garden is most definitely worth it’s price of $15.00. 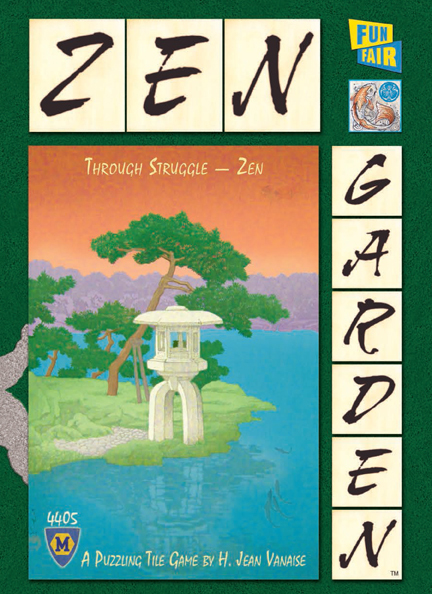 If you like tile laying or abstract games then Zen Garden is a great choice! We are giving Zen Garden 7 out of 10 stars.